Hey, Sankichi, what's in your lunch box? Since it bring toothache always. You are asking about this paste, aren't you? The population ration in Edo was; samurai, 10 : farmer, 81 : merchant, 9. There was no freedom to choose one's occupation. Job hunting / offering took place mostly in large cities like Edo, Naniwa etc. 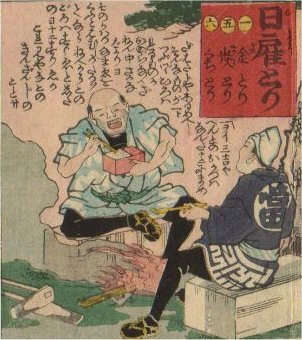 There was Kuchiiri-ya (scouting business) alias Kei-an (from the name of person who made matches of marriage or job against returns)　already in early Edo. Job hunter took the opportunity of interview by the employer with a recommendation card by a Kuchiiri-ya. Kuchi-iri-ya functioned as a guarantor too, so that employers could hire people with ease. The wage was settled by negotiation. The jobs for women were waitresses, mistresses or playing girls, for men were heavy labor like menservants, laborer and Hiyori-tori (day laborer) etc..